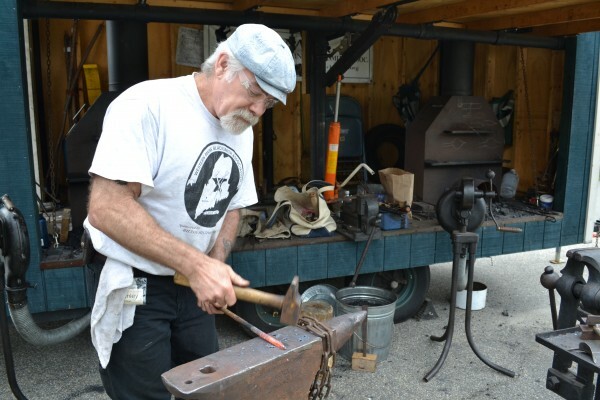 Stan Tilton of the Western Maine Blacksmithing Association demonstrates his trade at the Blueberry Festival Friday. 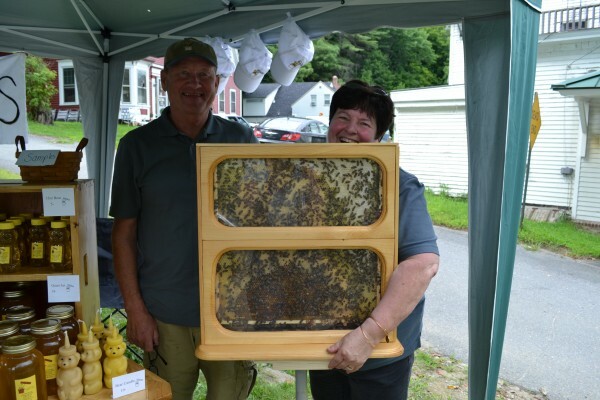 WILTON - The 33 year of the Wilton Blueberry Festival got underway Friday with craft vendors, food stands, blacksmithing demonstrations, free fire truck rides and much more. Main Street was crowded with excited participants, some who look forward to the event all year. 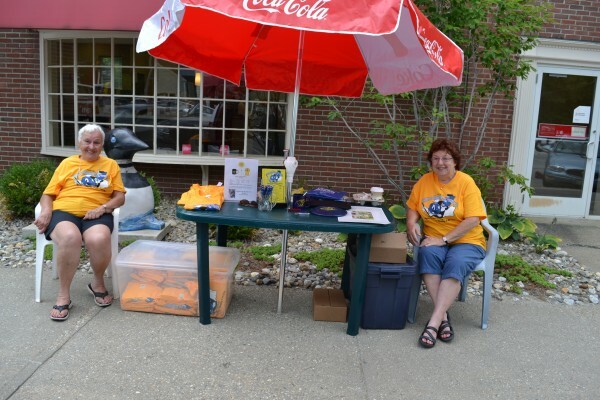 Liz Toothaker and Shirley Heutz have been volunteers at the information booth for several years now. “We’re here every year on Friday afternoon. People come to the table looking for us,” Heutz said. Toothaker was a resident of Wilton for 40 years and now enjoys the annual event to check in on her original hometown. “I love being here. I would do anything to help Shannon out,” she said. She is referring to Shannon Smith, who has organized the Blueberry Festival now for 25 years. No easy task, considering it involves fundraising $40,000, orchestrating a parade of 100 participants and overseeing a firework show over Wilson Lake. Not to mention that this year’s festival will include hot air balloon rides if the weather allows it. One way Smith has brought in money to help fund the event is by bringing in craft vendors. 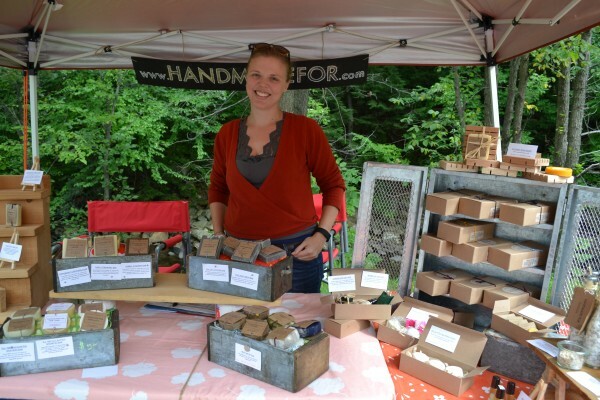 Rachel Smith is one of those vendors, selling homemade soaps, essential oils, lotions and other beauty products through her line ‘Handmade For’. “One of my biggest sellers is my beard oil. It’s more popular in the colder months, when men actually want to have a beard.” Smith is from Somerville, Mass. but her in-laws are residents of Farmington. She and her family have attended the Blueberry Festival for several years but this is only her second year of being here as a vendor. “I told my Grandpa that if he sold his cribbage boards I would sell my beauty products,” Smith points to a few cribbage boards at the side of her display. Her grandfather also invented and sells “book thumbs”- a wooden device that slides onto your thumb to help hold your book open. You can find Smith’s products on her Etsy site or at the Blueberry Festival tomorrow until 4 p.m.
Rachel Smith sells her beauty products, Homemade For. Shannon Smith always does an amazing job! She and her volunteers are outstanding! Thank you so much!